This is a book worth reading; it’s entertaining and insightful, building upon the best aspects of the much-praised BabyBarista blog and providing greater depth and color (or should that be colour?) to its characters and stories. It’s not a flawless novel, but it’s well worth your time. In the second volume of “The BabyBarista Files”, entitled Law & Peace: The BabyBarista Files, Kevan demonstrates his growth as a novelist. 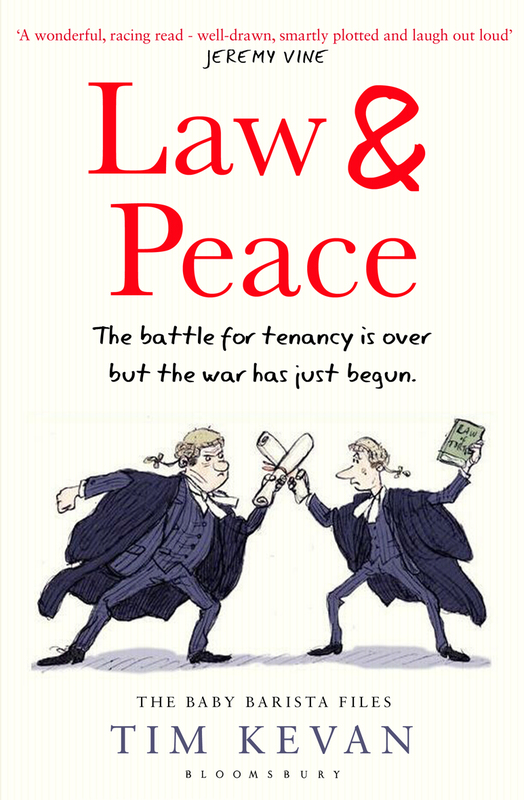 Law & Peace is as engaging as Art of War and its crisper plotting will likely make it more enjoyable for those who are less familiar with the idiosyncracies of the English bar’s pupillage and tenancy system. While readers of his earlier work will already be acquainted with the motley crew of supporting characters around protagonist BabyBarista, those who haven’t read BabyBarista and the Art of War (or as it was retitled later, Law and DisOrder) and don’t follow BabyB’s adventures online at either The Guardian or Kevan’s own BabyBarista site shouldn’t be deterred. His convention of referring to all but a few characters by nicknames allows us to follow the story without referring back to the character descriptions preceding the first chapter. As before, BabyB is an earnest figure who often does the wrong things for the right reasons. Struggling with the debts accumulated in putting him through his schooling and pupillage, this time out he becomes entangled in the unscrupulous schemes of a greedy solicitor, SlipperySlope, and of OldSmoothie, a barrister in his own chambers. As he finds himself out of his depth in their self-dealing and cynical plotting and targeted by TopFirst, a rival whom he bested in Art of War, BabyB relies on his wits to see him through. Ultimately, however, it’s his at times discounted, if never entirely discarded moral character which both enables his success and makes it worth cheering. As was the case with the first novel, Law & Peace is, in essence, a morality play. Various figures embody ideals whereas others are evils who tempt or persecute BabyB in this allegorical story. That and the novel’s point-of-view narration allow BabyB to always remain the focus of this story, but it necessarily shortchanges characterization for many of the supporting players. We learn more about some of the characters from the earlier novel and learn enough about those introduced in this one, but none of them are especially deep. They represent types, characteristics, and challenges, but they have little existence beyond acting upon BabyB for good or ill. The continuing adventures of BabyBarista are a Pilgrim’s Progress for the legal set; unlike that famous work, thankfully, BabyB’s progress is never a humorless slog. In reviewing Art of War, I wrote that its ending was “a bit too abrupt and convenient”. Law & Peace builds to a sudden, sweeping resolution of its various plotlines, but the result is much more in keeping with the narrative to that point and thus is more satisfying. As before, Kevan was kind enough to send me a copy of his novel for review and, as before, I’m glad to send another copy on my own dime to a friend, an expat Geordie lawyer, rather than part with my own. I’m looking forward to BabyB’s next novel-length adventure, though I think Kevan will be hard-pressed to come up with a fiction to rival some real shenanigans involving the English bar. Anyone who reads BabyB’s stories of his own and others’ misfeasance and malfeasance and thinks that these are simply unbelievable need look no further than today’s newspapers. If, as is alleged, a prominent lawyer for the now-defunct News of the World had a hand in the hiring of investigators to gather dirt on the private lives of lawyers representing phone hacking victims, can BabyB’s next adventure possibly be outrageous enough to rival reality?